The controller DULCOMETER® diaLog DACb is our compact all-rounder for water analysis. With its specially designed functionalities, e.g. 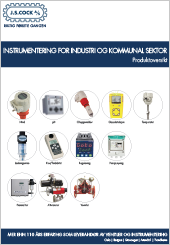 processing or interference variables and switchover of control parameters, it closes the control circuit between DULCOTEST® sensors and ProMinent® metering pumps. The two measuring and control channels of the DULCOMETER® diaLog DACb can be individually configured to meet customer requirements. Everything that you need for the reliable treatment of industrial and process water, potable water as well as swimming pool water. 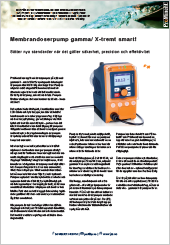 The new solenoid-driven diaphragm metering pump gamma/ X is user-friendly and has an outstandingly long service life, just like its predecessor. An ingenious solenoid control measures the back pressure and protects the system from overload. This technology makes a pressure sensor superfluous, meaning that operating safety can be significantly increased: no additional parts come into contact with the feed chemical, there are no additional sealing surfaces and no electronic components come into contact with the feed chemical. Whether the metering volume fluctuates or hydraulic failures affect the metering process – the gamma/ X keeps everything at your fingertips. Short description: The 2-wire AnaCONT instruments are designed to measure pH and redox potential values of liquids and aqueous solutions. pH measurement: Based on the signals of the submerged temperature compensated probe and the temperature sensor the smart signal processing electronic module calculates a pH value normalized to 25°C and generates a proportional output signal. Redox potential (ORP) measurement: Similarly to the pH measurement, the measurement of the redox potential is based on the potential difference between measuring and reference probes. Redox potential is a parameter that indicates the sum of oxidants and reducers in the measured medium. The output signals of the probes are processed by the electronic unit and it converts them into a proportional output signal. Measurable mediums: The AnaCONT LEP pH transmitters are able to cover the whole 0-14 pH scale. The AnaCONT LER ORP transmitters measure in ±1000 mV measuring range. Application restrictions: The long term stability and accuracy of the measurement requires a periodic calibration of the sensors using the standard buffer solutions. It is important that the temperature and pressure limits of the measured medium is not exceeded, and to keep the sensor mounting angle requirements, as well as the required cleaning. Advantages: Wide probe selection according to the application in one unit or in separate with extension up to 10m. 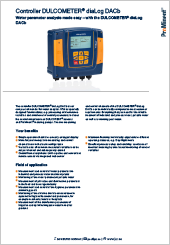 With IP68 protection for applications with risk of flooding.